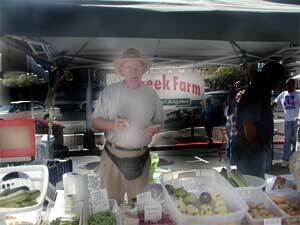 Dry Creek Farm is a regular at the Port Angeles Farmers Market. While they bring in the fresh vegetables, their real prize is their eggs. Dry Creek Farm is certified organic, and their eggs have that full egg flavor that supermarket eggs seem to have lost over the years. Once or twice a year they cull their flock. and that means chickens. Actually, it means stewing hens, since these birds are not spring chickens. They might be a bit tougher than the supermarket babies, but when cooked properly (see below), they make mighty good eating. Dry Creek Farm sells excellent stewing hens, but you can't cook a stewing hen like a roaster. Stewing hens are older, tougher birds, and part of their intense flavor comes from the years spent running around the yard and hanging with the other chickens. Some people have bought Dry Creek hens and just rubbed them with garlic, salt and pepper, and popped them in the oven. That is the recipe for one tough bird. We recommend a nice long bath in red wine and herbs and then slow cooking in the marinade to get a rich, tender hen. Check out our stewing hen recipe and check out one of Harley's hens. 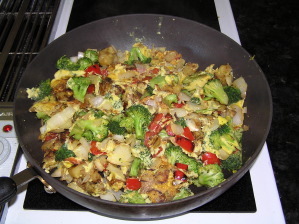 This omelet may look like a mess, but it is a great way to cook up a mess of vegetables. There are Yukon Gold potatoes for heft, red peppers and sweet onions for taste, and broccoli for health, but what holds it together are good organic eggs.